Inspiration for my french toast comes from a variation on several of Martha Stewart’s recipes. I never missed an episode of her Sunday afternoon cooking and home show that aired in the early 90’s. I video taped every episode and studied them well. I have always admired her drive and desire for perfection and I have learned much from her over the years. 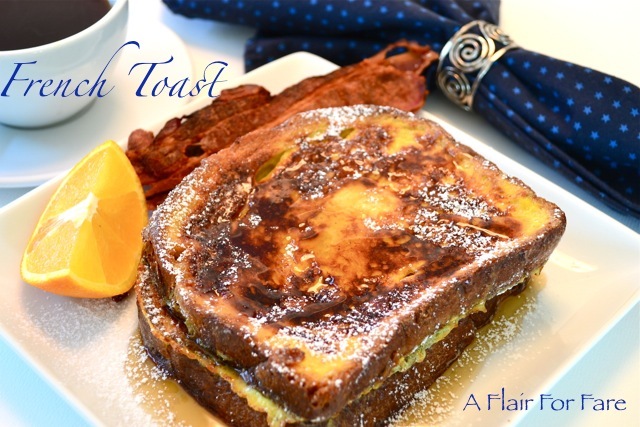 A favorite Sunday morning treat, this recipe brings back so many fond memories of weekends spent with my son Bryant and his requests for his favorite “Martha Stewart French Toast”. An egg bread such as Brioche or Challah makes the best french toast, but a hearty white bread will be fine. In a medium size mixing bowl, whisk together the half-and-half, eggs, cinnamon, sugar, vanilla, grand mariner and orange zest. Use a large heavy skillet or non stick electric griddle at medium low heat (300 on griddle). Add 1 tablespoon flavorless oil, such as grape seed oil and spread around pan. When oil is hot add 1 tablespoon butter, just before adding bread. Dip bread into egg mixture, allow to soak for 30 seconds on each side, add to heated pan and cook until golden brown, about 2 to 3 minutes per side. If using a skillet, cook 2 pieces at a time, adding more butter as needed for each addition. Dust with confectioner’s sugar. Serve with warm syrup.